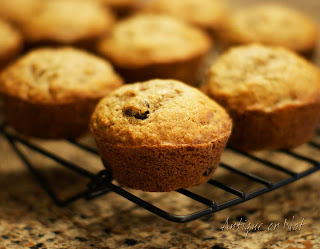 Yesterday I was baking up a batch of banana bread muffins (complete with nuts and chocolate chips, of course!) and decided that I wanted them to look a little more festive. This is my Kaiser mini-bundt baking pan, which I absolutely love. 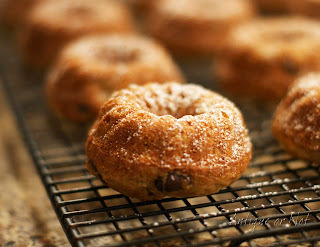 Your "muffins" turn out looking like tiny little bundt cakes, and they cook a few minutes faster than muffins do. Same great muffin batter, but two totally different looks. Now my "muffins" look like tiny little Christmas wreaths powdered in snow. So when you're ready to do some Christmas baking but you don't have the time to make a lot of fuss, think outside the box...one small change can make all the difference in the world. What delicious combinations, banana, chocolate and nuts. Very pretty and festive in the little bundt pans. These look great. I have at least 10 frozen bananas for making breads etc...I'll have to try the bundt pans (I have individual ones and add the powdered sugar! How cute....wish I had one to eat with my cup of coffee this morning! I can almost smell them! Wow. That's a nice touch. They sure look fancier!